below that skin – tender, juicy meat that has very nice flavour and aroma. 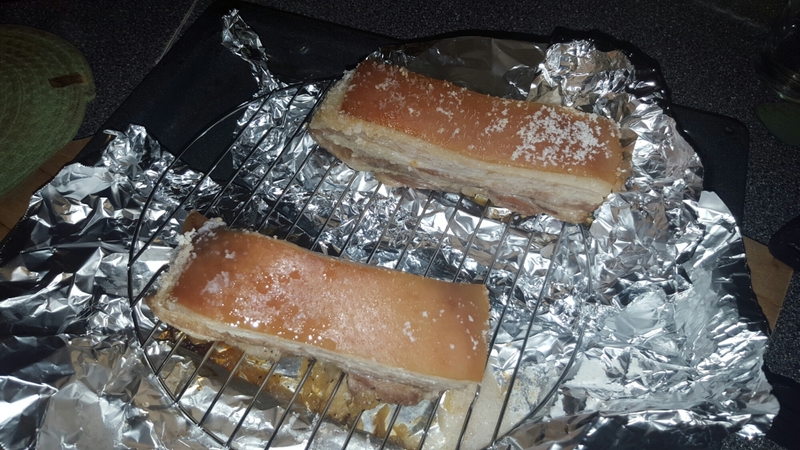 My parents own a turbo cooker and have cooked pork belly, but not the way I remember as a kid. So I decided to have a go at it. The long wait: marinating in the fridge. 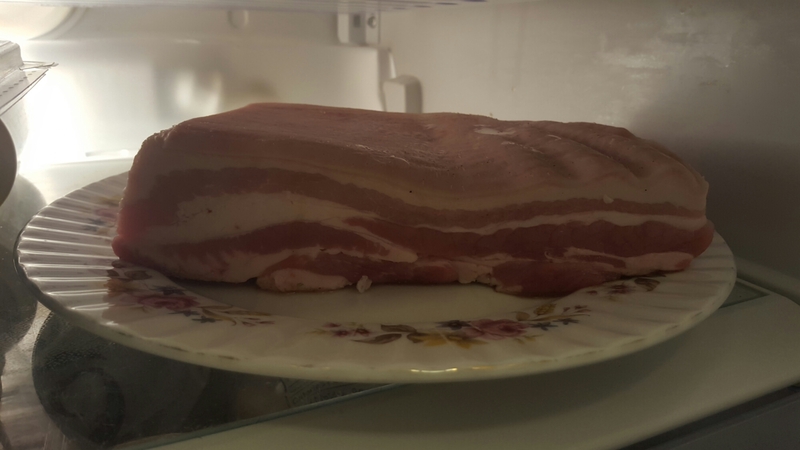 This slab of nice meat had to sit in the fridge (skin side up) for a minimum 12 hours before cooking after applying a dry rub mixture to the bottom. After doing my own research, I gleaned what I thought would be best to use in my recipe from 3 or 4 different sources found both online and in cookbooks (one was written in Tagalog and I needed someone to help translate). 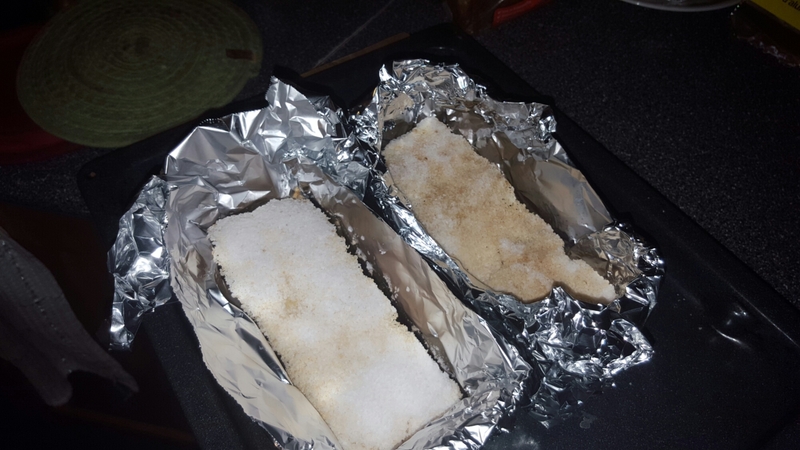 The preparation and techniques in the recipes I found were relatively simple. My constraints? I didn’t want to use any fancy gadgets in my recipe – just the use of an oven or a grill to cook the meat. I wanted the prep to also be simple due to how busy everyone gets. Finally, I wanted a quick cleanup. I cut the slab in half and to try two different cooking methods. Foil around the meat to seal in juiciness and flavour. A light coat of vinegar on top with a generous salt coating on top of the skin to keep the skin dry and cure it while “baking”. 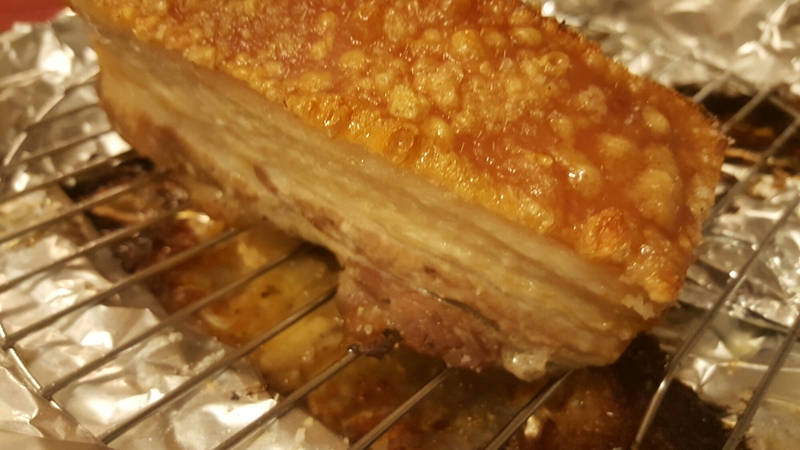 Finding the pork belly in my part of town was simple – I have an Asian grocery store called Oceans that is a short drive away from my house and several other notable Asian groceries within walking distance of my commuter train station. I was also lucky that this particular meat was on special this week – $3.59/lb!! I found myself an $8 dollar slab and immediately went to work on it. Out of the oven after an hour…wow! Juicy! Removing the salt and getting ready for broiling the skin. 24 hours later, I can say my first attempt was a success! The marinating was the only lengthy part of the this process, while the actual cooking process took about an hour and a half in the oven. 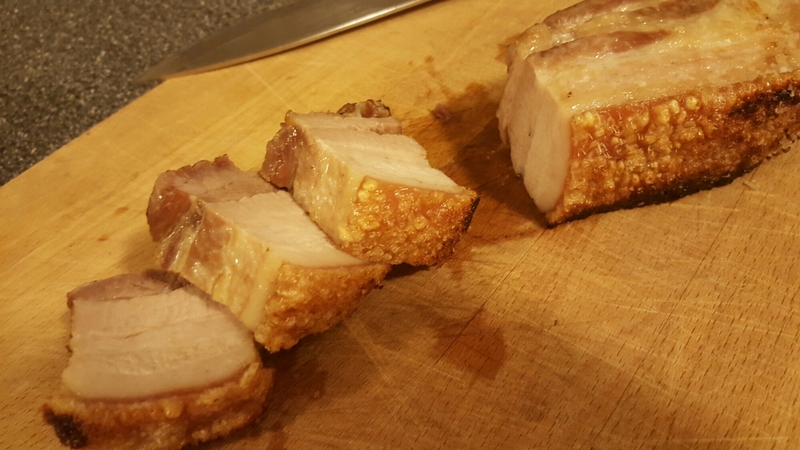 The skin, to me, was cooked more in the Chinese style than Filipino style, but it, and the meat, had all the characteristic aromas, flavour, tenderness and juiciness I was looking for. 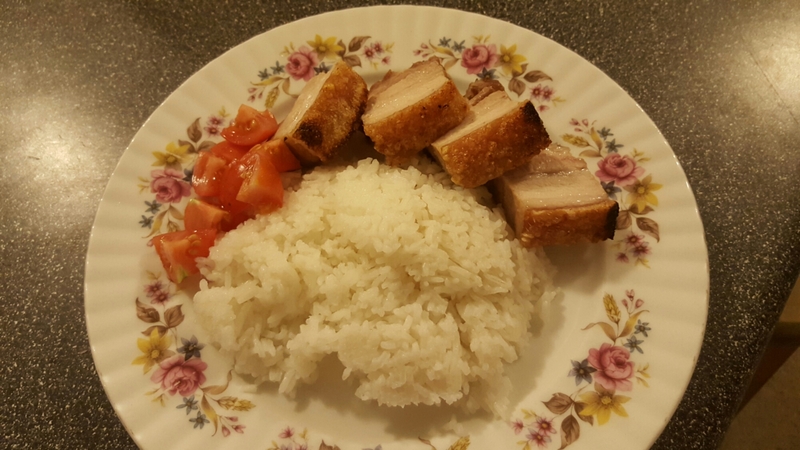 This is typically served with rice and tomatoes (as shown in my first pic, above) as well as a liver sauce (a recipe that I’m still hunting for) or a vinegar and crushed garlic mixture (sometimes with a little fish sauce) for dipping. Dijon mustard can also be used as a dip. I enjoyed it with a few cans of hard apple cider. Safe to say I suffered a meat coma, or should I say “bacoma”, after enjoying the fruit of my labour! Yum! Juicy, flavourful meat with a crispy, golden skin! The recipe is still far from final – I’m looking to tweak it a bit more but I have a good base to begin with. In the meantime please enjoy the pics! Also, feel free to ask questions by commenting below.